Japan is in financial trouble. If major changes to policy are not made soon, Japan will be unable to meet social welfare obligations to its own citizens—and to the immigrants who have paid diligently into its social systems. One of the ways that Japan can change its course in the immediate is by altering both its legal policies and cultural acceptance of larger (although not large) scale immigration. As a country devoted to government administration and protection of healthcare and retirement income, Japan's rapidly ageing and yet declining population is straining social insurance schemes. Too many pensioners, too many medical demands, too few (and increasingly fewer) taxpayers. Is this the vindication of Japan's burgeoning Reaganites/Thatcherites, who argue that state directed social welfare nets are demonstrably doomed to failure? Or might the key be found in Japan's often undiscussed, often invisible immigrant class? To find the answer we need to look at the flaw in Japan's social model. This flaw, far from being inherent to socialist economic systems is one to be found in modern capitalist systems as well. It is a flaw not inherent to either, but rather one which infects our current thinking on economic philosophy worldwide: the assumption of infinite growth, especially in terms of population. The problem is not to be found in state directed social services but rather in the idea that population growth will continue to provide taxpayers. In far less regulated mixed economies, like the United States, the emphasis is on the idea that population growth will continue to provide consumers. Both taxpayers and consumers can be thought of as one single economic concept: payers. Therefore this is not a conceptualisation difference between socialism and capitalism, but in fact a conceptualisation which current socialist and capitalist industries share. So if this is the flaw, does that mean that growth is impossible, or perhaps not the best metric for determining an economic system... or still further, does it mean that growth is bad? I don't think so. Despite claims by xenophobes to be found in some western countries like the United States or Australia, or even France and Germany, immigration is good when looked at as part of growth being good. If growth is good, and growth is desirous, then immigration cannot be bad. There can be better or worse degrees of immigration, but immigration as a whole cannot be bad. The claims of "they're taking our jobs, they're using all of our social services" are silly. But why? Because social services assume, fundamentally, that those using social services are often (although not always) those least capable of paying into the system. This isn't a flaw, as is often cited by laissez-faire proponents, it's a feature. Social services are designed to be social safety nets. The services "catch" those that "fall" out of the more unregulated aspects of the economy (private industry employment, for the most part) and lack the resources to otherwise survive until finding another way to enter the economy as a net contributor. One of the oddest issues with the Japanese economy is that of stagnation and depressed prices. Japan may seem to be one of the most expensive places on Earth, and that is because it is. However, it is actually significantly less expensive today than it was in the 90s prior to the Japanese economic bubble bursting. Japan is a nation of savers, not debtors, and certainly not investors in futures, commodities, or stocks. Japanese do invest in bonds, but these are government issued and this is how most of Japan's debt exists: owed largely to ourselves. I count because I also invest, taxes and pension and otherwise, in Japan. But social services only exist when people pay into them, and are still largely seen as "benefits." Opportunities to pay into a system which will support you because you have a stable income. Too many young Japanese no longer have a stable income or never even had one, and this depression on Japanese wages is starting to affect immigrants to Japan, whether temporary or permanent. As a foreign language teacher, I have seen my salary drop from 270,000 yen a month (let's just us a 1:100 ratio for now, as it has fluctuated over the time I have been in Japan from slightly below to slightly above, $2700, and so on) to 250,000 yen a month, to 230,000 yen a month... And yet my experience has gone up tremendously. And I still have to contribute to taxes and pension. Sure, they're adjusted down a bit, but not by much. Casualisation of a workforce is the reduction in full or part time employees and their replacement with employees who are called in on an as-needed or casual basis. This can reduce the employees working conditions by reducing the commitment from the employer to them, and giving the employer opportunities to control them by reducing their hours. Casual workers can be more difficult for employers to manage as they have no guarantee of finding available employees at any time, but they have the advantage of only employing people when they have the work for them. Prior to early 2000s, Japan had a much different system in place. The standard was jobs for life. After a ridiculously hard schooling system (a system I am intimately familiar with, having taught in almost all levels of it from pre-school to junior high school and visits to various high schools) with exams for entrance into high school and even tougher exams for entrance into university, the four years of university were seen as an almost-vacation. If you got into the right school and did a minimum level of job hunting (or were recruited, for the top schools like Tokyo University, Kyoto University, Waseda University, or Keio University), then you had it made. No longer anymore, starting in the mid-2000s, and into the time I moved to Japan (May of 2008), an entire "lost generation" of under-employed university students now exist. Although hiring has seen a rebound of sorts since 2010, it has always been Japanese practice to hire, just as they did before the mid-2000s, fresh graduates. The "lost generation" is seen as too old to start out in entry level positions. This is the reason why the "lost generation" has become known as the "lost generation." Japanese business practices simply do not know how to deal (or perhaps represent an unwillingness to deal) with slightly less moldable, less impressionable employees. The members of the lost generation are seen as potential threats to intra-office harmony because they have been corrupted by years of employment, under-employment, or in some cases no employment during the preceding seven or eight years. This is an entire generation which will enter old age without having paid much or not at all into the healthcare or pension services which should, hypothetically, exist to take care of their needs. The social insurance schemes are already stretched thin with the amount senior citizens drawing on funds faster than they can be replenished. Although many of them did contribute to the systems when they were younger, many of them did not. And as medical technology combined with generally good health of Japanese elderly, what was contributed was never expected cover the long lives Japanese citizens and permanent residents are living. When the "lost generation" enters into retirement age, there will be very little they have contributed there to take care of them. And they will live even longer. The health of an economy depends upon the ability of currency to circulate, but it is a balancing act. Money must circulate fast enough to keep prices from falling which eliminates profit, but not too fast, lest that lead to inflation. Prime Minister Shinzo Abe was hoping to eliminate Japanese deflation by increasing the money supply, but that just causes inflation while not necessarily creating circulation. What does it mean to "increase the money supply?" Well, in this case, it probably means releasing stored money held in the Bank of Japan, but it could literally mean printing more money. The idea here is that the "new" money (either released or printed) can then be used to pay for government expenditures through Bank of Japan loans to Tokyo or loaned out to banks to be loaned out again to individuals. Employees, defense spending (which Abe is for, but that's another topic entirely), infrastructure... That money will, in theory, then come out into the economy as the employees, contractors, and subcontractors go buy stuff. So what's the problem with Abe's plan? As stated, Japanese people save. One of the few booming industries in Japan has been in second hand goods. Japan still has a cultural devaluation of second hand goods and so resale shops can buy low, sell relatively low still, and make rather large amounts of profits. Yet this actually hurts an economy where no new goods are being introduced, because those jobs are gone. But it does allow people to keep consuming at a much lower price point and save the rest. If you give current Japanese more money, the majority will take it right back out of the economy, either by placing it in accounts with no interest, or by putting it in jars, books, under the mattress, pension plans, insurance, bonds. Not that fancy new television or sound system or Japanese made car. It will just sit there. So who do we get to spending rather than saving? More people. That's really the core problem here. Japan simply needs more people. More young people. More young people with jobs and ambition who are going to purchase more, save less (but still pay taxes and into the social insurance schemes), and need goods and services to be provided while in Japan. This is something Japan could have done without immigration by having more children. However, because the birthrate has so far declined since the bubble burst in the 1990s, these people will not be ethnically Yamato/Jomon. Even if Japan started having children in great numbers today, and there would be a bump in spending due to the need for baby products, childcare, schooling, children's clothing, etc... Yet these children, while paying into the economy (through their parents) would not be contributors to the social insurance schemes. For that, you need adults. And so we come to the necessary conclusion that Japan needs an immigration expansion. But what kind of immigration expansion would be best? 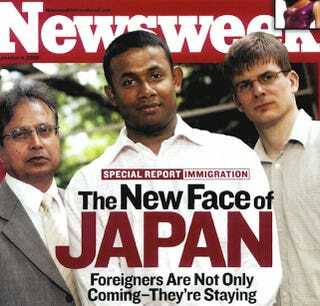 There are already large amounts of Southeast Asian immigration into Japan. Western immigration is probably the most well known to Westerners outside of Japan although it actually isn't as large as from other areas of Asia. Many Chinese students come to Japan, but they usually go back to China with what they have learned. The truth is, I think the current mix of immigration in Japan is quite good, we just need more of it. We need both Western immigration and Southeast Asian immigration, although for different reasons. We need to deal with an elephant in the room here; we need to talk about the class difference between these two groups, as well as the inherent Western (well, white, even if not all Westerners in Japan are actually white) privilege being used here. Traditionally, Western immigration has been English speakers into English teaching job. There are also examples of translation (which requires quite a bit of Japanese language education) work and information technology work, with some programming, game design, and graphics work. There are also an increasing number of English language reporters living, working, and writing in Japan about Japan but for non-Japanese audiences or for expatriate audiences (like me!). These are all likely to be fairly well-off, well educated, majority white Westerners. People who have the education to get these jobs, the experience to keep these jobs, the funding to make the move, and a certain expectation about standard of living which presumes consumerism, especially in regards to durable goods. Southeast Asian immigrants, however, are generally not in the category of fairly well-off (by developed nation standards), nor well educated. They generally end up in manufacturing jobs in factories across Japan. Japan has a great trade union system built up, and Japan does have a pretty good minimum wage, and at least on paper, labor law is pretty standardised and pretty tough. However, workplace abuses do still sometimes occur. Japan needs its manufacturing base. It absolutely does. Japan needs to continue to produce durable goods as it always has. Japan needs to fill these manufacturing jobs with people who are willing and able to take them—and it needs to have companies willing to pay people living wages so they can purchase what they actually produce and can actually pay into the social insurance schemes. This isn't going to happen overnight, but it will eventually happen. Western immigration can help, because these are the well paid, highly educated, consumerist (in general, and I am no exception) immigrants who will pay for the durable goods being produced in Japanese factories, and they won't mind a little inflation now and then. Westerners are used to the idea that prices rise a little bit each year and overall, won't tend to balk at a 10 yen increase on a cheeseburger. Many Japanese, used to twenty years of deflation and depressed prices and expecting earnings to continue to drop, absolutely will balk at such a price increase. With prices raised and people to pay them, and factory workers actually making living wages, lo and behold, money will start circulating! Which, as stated, is the goal here. Both of these immigrant groups will be paying into the social insurance schemes as well as making consumer purchases. Healthy inflation will be the outcome, and as long as there is still regulation of the economy to keep it from going too far, Japan will see an economic resurgence. Make it clear that immigrants are welcome to settle in Japan long term and they will be more willing to keep their money flowing within the Japanese economy as opposed to sending it abroad. This will also be an incentive to pay into the social insurance schemes because if permanently settled, immigrants will expect these social insurance schemes to be there when they need the funds in the future. Yet before we get too starry-eyed about increasing settlement in Japan, I did say limited. And I mean that. What do I mean by limited? Like any other society dealing with the effects of immigration, many Japanese are concerned about what will become of Japanese cultural identity. This is a grave concern among several of my coworkers who have expressed sentiments like, "well, I don't mind you staying here or you becoming Japanese. You respect and participate in Japanese culture, but many other people who come to Japan from other countries do not. I do not want these people to stay in Japan." It is a fair question, although I think it mostly applies to folks who would not want to stay anyway. It can also sometimes be used as a polite way to cover blatant racism or homophobia with the idea being, "these people can't really assimilate, because they're so different, only the exceptional ones, like you, can do it." I think the answer is for any Japanese administration which expands immigration to expand it carefully and to set about placing certain incentives into place. Right now citizenship already has a language requirement (third grade level Japanese, this is really, really quite low, and should not take most people more than a couple of years in Japan. Most Westerners I know already show up with at least this already), but there is not one for permanent residency. There is preference on the longest visa type other than permanent residency, five years, which views Japanese ability favorably. I think these incentives could be expanded. Maybe giving an option of permanent residency without marriage earlier to those who show Japanese ability. I would also support the movement to a citizenship/permanent residency test or visa test which would show a basic understanding of Japanese culture and legal framework. I am aware that these ideas probably aren't going to be particularly popular among many expatriates. Honestly, I don't much care. Japan is already a de facto immigrant country, and it behooves both the government of Japan and the Japanese people to recognise this fact. If Japan is really committed to stopping its economic and population decline, it will seriously look at increasing immigration and setting policies which will encourage, but not force, assimilation of immigrants into the wider Japanese cultural context. What it means to be Japanese is already changing, and has already continued to change, Japan must recognise this fact and embrace it for the social good.